If you look across a sample of graduate students receiving stipends within any given field, you will find that they have quite similar day-to-day activities: taking or teaching classes, researching, writing articles or chapters, applying for funding, etc. However, behind the stipends that allow these students to engage in their studies are two very different types of sources, which the student’s tax forms reveal. (This distinction and the tax-related details herein are for graduate students in the US.) Whether a student has one type of funding or another has implications for his taxes, access to retirement accounts, and possibly university benefits. The type of pay that is behind a graduate student’s stipend potentially affects several aspects of her finances, depending on the university’s policies. 1) The tax forms generated by each type of pay differ. Students with compensatory pay will receive a W-2 in January. Students with non-compensatory pay will see their pay listed on, depending on the university’s policies, a 1099-MISC in box 3, a 1098-T in box 5 (probably summed with the scholarships received), or an unofficial courtesy letter. It is also possible that students with non-compensatory pay will receive no additional notification at tax time. Despite these different reporting mechanisms, a graduate student will report both types of pay in line 7 of his 1040 (with “SCH” denoted next to the line to indicate non-compensatory pay). 2) Graduate students receiving compensatory pay will have the opportunity to have income tax withheld from their stipends, while graduate students receiving non-compensatory pay may or may not, depending on the university’s policy. If students receiving non-compensatory pay do not have the option to have income tax withheld, they may have the responsibility of paying quarterly estimated tax. 3) With rare exceptions, graduate students cannot elect to contribute to retirement accounts at their universities. Therefore, graduate students who wish to save for retirement inside a tax-advantaged account typically opt to contribute to an Individual Retirement Arrangement (IRA). However, only compensatory pay (aka ‘taxable compensation’ or ‘earned income’) is eligible to be contributed to an IRA. Graduate students who receive only non-compensatory pay in the course of a calendar year (and are not married to a person with compensatory pay) are not eligible to contribute to an IRA in that year (though they can still save for retirement). 4) Full-time graduate students typically do not pay FICA tax on their stipends, but the reason for this is different between the two types of pay. Graduate students with compensatory pay enjoy a student exemption to FICA tax, whereas non-compensatory pay is not subject to FICA tax in the first place. This distinction is important if graduate students ever become predominantly viewed as employees rather than students, which sometimes occurs in the summer when they are not enrolled in classes. In that situation, they might lose their FICA exemptions temporarily and have to pay additional tax. 5) The benefits that universities extend to students may differ based on their status. Graduate students receiving non-compensatory pay are unambiguously students in the eyes of the university. Graduate students receiving compensatory pay are both students and employees, and universities have varying views on which half of that balance is dominant. In some cases, when graduate students are considered employees, different or additional benefits may be extended to them that graduate students who are only students do not receive, such as union membership, childcare subsidies, and pensions. While graduate students receiving compensatory and non-compensatory pay likely have very similar roles within the university, you can see that the IRS and the universities draw a number of distinctions between the groups that become important at some points in a graduate student’s career. If you are unsure which type of pay you are currently receiving or received earlier in the calendar year, you can either wait to see which kind of tax form you receive (W-2 for compensatory, anything else or none for non-compensatory) or inquire within your university’s payroll or financial aid office. Have you received compensatory, non-compensatory, or both types of pay during graduate school? Was there a time that you realized that your type of pay affected your life materially? Do compensatory and non-compensatory students receive any different benefits at your university? PhD students are funded by a variety of sources: research assistantships, teaching assistantships, graduate assistantships, training grants, and fellowships. It’s typical to be funded by two or more of these difference sources over the course of your PhD, and the funding source can change year-to-year or even semester-to-semester. While the differences among these funding sources are sometimes subtle, one stands apart from the others: Being funded by a fellowship, particularly a nationally recognized one, is in many ways superior to other forms of funding. I believe every prospective and graduate student should apply for at least one fellowship per year (assuming you are eligible for any). I recently compiled a list of nine portable, broad, lucrative fellowships that prospective PhD students can apply to. Many on that list plus more fund 1st- or 2nd-year PhD students, and there are fresh funding opportunities for PhD candidates with a clear research focus or who are nearing the ends of their dissertations. At the graduate level, fellowship funding is usually preferable to assistantship or training grant funding. This point may seem unclear until you understand the definition of “work” being used. Assistantships are a part-time job and typically require the assistant to work 20 hours/week. Fellowships are a type of award, which means that they are not tied to a specific work requirement. Fellows are still required to make progress toward completing their degrees, which will of course involve classwork in the early years and research throughout the PhD. But students who receive their full stipends from fellowships are excused from doing an assistantship. The advantage of being paid by a fellowship rather than an assistantship is more pronounced in some department than others. 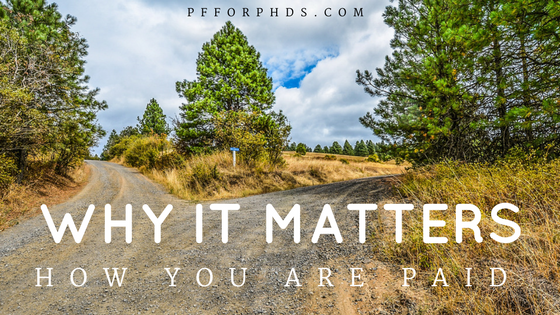 The ideal situation for a PhD student, and what a fellowship provides, is the ability to put 100% of your effort toward achieving your professional goals (mostly working on your dissertation). Research assistantships are a mixed bag. In some fields, such as STEM fields, research assistants spend all their time conducting research that will become part of their dissertations (the topic of which is guided by the projects/funding available in the advisor’s lab). In other fields, the research that a research assistant conducts will not become part of his dissertation, so again that is time taken away from dissertation work. Basically, for teaching and non-dissertation research assistantships, you have to work on your dissertation above your 20 hr/week job, while fellowships and dissertation research assistantships allow you to devote your full working time to your dissertation. Most external fellowships provide a specified amount of money for your stipend plus money to go toward your tuition and fees (either to pay them fully or up to a certain amount). For example, the stipend specified by the National Science Foundation Graduate Research Fellowship Program is $34,000/year, by the National Defense Science and Engineering Graduate Fellowship is $102,000/3 years, and by the Department of Energy Computational Science Graduate Fellowship is $36,000/year. The stipend provided by an external fellowship is usually higher than the stipend you would have received from an assistantship or training grant. Even if the fellowship stipend is lower, some departments will supplement the fellowship stipend up to or above the departmental base stipend. It’s unusual, though not unheard of, for a fellow to receive a lower stipend than his classmates funded by assistantships or training grants. An external fellowship also confers rare negotiating power to you. Negotiation is likely to be most effective when you are a prospective graduate student with multiple offers to (tactfully) play off one another. The fellowship stipend might be supplemented by a department every year, or the department might pay a one-time bonus to the fellow. If you receive a fellowship while already enrolled in a PhD program, you can also ask for a supplement or bonus. (Be sure to ask other fellows in your department if any extra money was conferred to them.) Something else you can negotiate for is additional years of guaranteed funding after the fellowship ends. Because fellowship money is separate from your advisor’s grants, it can in many cases increase the control you have over your own research pursuits. It may allow you to shift the focus of your dissertation away from the main thrust of your advisor’s research, facilitate a collaboration with another group, or add a side project to your dissertation that isn’t aligned with your advisor’s grants. In addition to paying your stipend and (part of your) tuition and fees, some external fellowships award you additional money for conference travel or professional development. There is one clear financial disadvantage to being funded by a fellowship (or other source of non-compensatory pay) for at least one full calendar year, which is that fellowship income is not eligible to be contributed to an Individual Retirement Arrangement (IRA). Unless you have a side income or are married to someone receiving compensatory pay, you won’t have access to any type of tax-advantaged retirement savings vehicle. While the best result of applying for a fellowship is that you’ll actually win it, there are positive side effects even if you don’t. 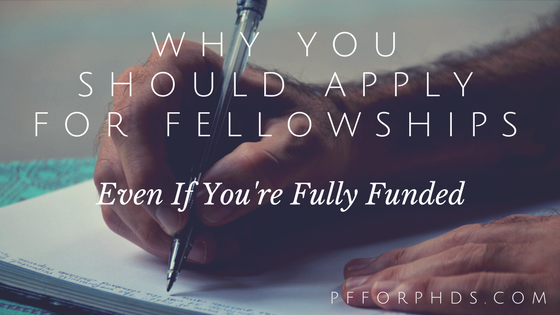 Applying for fellowships when you’re not required to (like you have a guarantee or reasonable expectation of funding) shows you are willing to take initiative to further your training and career. You are trying to provide for yourself instead of depending on your department or your advisor. Even if you are not successful, this is an admirable quality; your advisor or potential advisors will probably be impressed at your effort. Applying for fellowships somewhat resembles applying for grants, although usually abbreviated. If you are going to be a career researcher, you will have to develop the skill of successfully pitching yourself and your ideas to funding agencies. Applying for fellowships and predoctoral grants is good practice for the larger grants you’ll apply for later. The most compelling advantage to winning a nationally recognized fellowship is not its superiority as a funding source or how the process benefits you or your advisor, but rather its role as a CV-booster. Winning a prestigious fellowship early on in your career sets you up well to win larger and more lucrative awards later on. While it is of course possible to win fellowships and grants later in your career without winning one in graduate school, it is advantageous to have been favorably evaluated in the past by another agency. Winning a fellowship in graduate school is an early step in creating a track record of obtaining funding for your research, which is something hiring and tenure committees look for. Prospective graduate students should apply for at least one large, multi-year fellowship (assuming eligibility) so you, if nothing else, can tell the PIs you’re interviewing with that you did it. If you’re in a STEM field, the NSF GRFP is likely to be your first stop. Once you’re enrolled in graduate school, you should consult with your advisor about which fellowships to apply for, at apply to at least one more in your first and second years and any later years in which you are eligible. The full cost of applying to PhD programs is significant; it can easily surpass $1,000 and even reach a few thousand dollars if you take a GRE prep course, apply to a large number of programs, and/or pay out of pocket to visit the universities you applied to. Given the enormous impact where and with whom you do your PhD has on your career, it’s vital to present yourself as well as possible in your applications and interactions with faculty. Mostly that’s going to translate to a large investment of time and energy, but sometimes it does translate to spending sufficient money on the application process. 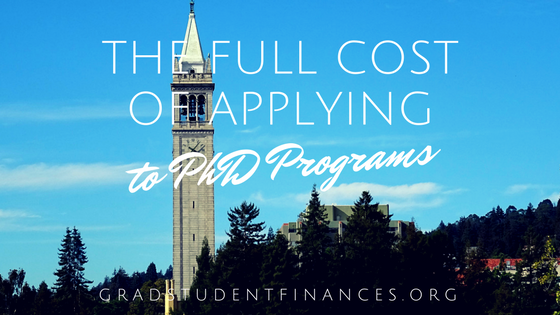 This post outlines the three main direct costs of applying to PhD programs so that you won’t be caught by surprise during the process and can adequately prepare for this expenditure. PhD programs are amazingly diverse. There are field-to-field differences as well as university-to-university differences. It’s imperative that you grasp how the admissions process works in your field and at each university you apply to. There are different expectations regarding the personal and/or research statement that you write, whether you should contact individual faculty members in advance of submitting your application, the purpose of a campus visit, etc. Another massively important difference is the level of financial support offered to PhD students and what form it comes in. You might be funded by a fellowship, training grant, teaching assistantship, research assistantship inside or outside of your dissertation advisor’s group, or graduate assistantship (or some/all of the above). The support might be year-round or only during certain semesters, and it might be guaranteed for a certain number of years or at the discretion of your advisor or department. You might or might not have to pay fees or insurance premiums out of pocket. You must to know what is typical in your field to evaluate the offers that are ultimately extended to you. The best way to figure out these largely unspoken cultural and policy differences is to ask current students or recent graduates of the programs you’re interested in. Tap your alumni networks and any relevant personal connections (LinkedIn can help you find these). Faculty members in your field at your current institution or a faculty advisor charged with supporting prospective PhD students are also wonderful resources. While the predictive capabilities of the general GRE have come under fire, most universities in the US still ask for general GRE scores and sometimes subject GRE scores on their applications. Further listening: Seriously, Can We Ditch the GRE Already?, Does the GRE Predict Which Students Will Succeed? The registration fee to take the general GRE is $205 and to take the subject GRE (biology, chemistry, literature in English, math, physics, and psychology) is $150 as of July 1, 2017. Test-takers with qualifying financial needs can receive a 50% discount on the fee. If the programs you’re applying to weight the GRE in their admissions decisions, such as by setting a minimum score, you could decide to study for the exam so you can perform your best. You can avail yourself of free resources available through the ETS website or purchase a review book (tens of dollars), course (hundreds of dollars), or tutoring (thousands of dollars). Whether or not you spend money preparing for the test, you may choose to devote significant time to it. However, extensive preparation for the exam is totally optional, and your time may be better spent on other aspects of your application. This spreadsheet lists all the application costs in detail and calculates your total budget. Many universities also offer fee waivers for qualifying applicants, the details of which can be found on their websites. In addition to the application fee that the university charges, you will also usually pay a fee to send your GRE scores and transcripts to each university. You can choose to send your GRE scores to four universities for free on test day for the general GRE and upon registration for the subject GRE. To take full advantage, make sure your application list has four schools finalized on it before you are prompted to send the free scores. ETS charges $27 to send your score from each test to each additional recipient. With the full cost of each PhD application hovering around $100, the cost of applying to a handful of PhD programs adds up quickly. Determining the number of schools to apply to is a challenge: too few, and you risk the randomness of the application process leaving you with no acceptances; too many, and you spend a lot of money and spread your time thin, possibly harming your chances of getting into the university that would fit you best. Another field-by-field difference is whether the application process involves an interview or campus visit. Some programs admit or reject applicants outright, and if a prospective student wants to visit the university, she’ll do it on her own dime and schedule. Some programs request interviews, but the interview is conducted over video or the prospective student pays to visit campus. Most STEM programs arrange for a visit weekend, where a group of prospective students is flown to campus to meet with faculty and be courted by the program. That visit weekend might include interviews upon which the admission decision will depend or simply serve to sell the program to admitted students. The out-of-pocket costs for the visits could be $0 if everything from the flight to your meals are paid for by the department or reimbursed (be prepared to front money, though!) or the applicant could be responsible for the full cost (up to hundreds of dollars for flights, lodging, ground transportation, and food). Even if you think the program will pay for everything, it’s a good idea to budget some walking-around money for each visit in case a meal ends up going unreimbursed or you want to do some sight-seeing or buy a souvenir. While deciding what programs to apply to and preparing your applications is very time-consuming, it can be done on your schedule. One of the hidden costs of campus visits is the time it takes to leave school or work for 1-3 days. If you have a (part-time) job, save some vacation time or try to shift your hours around so that you don’t have to forgo any wages to go on the visits. However, for schools you are seriously considering, it’s worthwhile to miss work to properly evaluate the programs, and that will need to be factored into your applications budget. The temporal and monetary cost of applying to PhD programs generally – and the application fee in particular – serves as a disincentive to apply to too many programs. It takes so much time and money to fully investigate and apply to each program (not to mention actually choosing which you will attend!) that you should be judicious about which institutions make your list. This requires carefully evaluating your own research and career goals as well as the programs, but you will without question benefit professionally and personally from this careful introspection in the application stage. How much did you pay to apply to graduate schools? Did you incur any costs not listed here? Two young adults graduate with the same major from the same college in the same year. One of them gets a job and the other enters a funded graduate program. Their financial lives have just diverged, despite their similar professional starting points, and it’s not because the graduate student lacks an income. Here are the top ways graduate students are financially distinct from their young professional former peers. Graduate students are among the best and the brightest college graduates, but that isn’t reflected in their stipends/salaries. The value proposition of graduate school is that the student will be provided with training, and therefore the stipend is only intended to cover living expenses (more or less) to keep the student from undertaking outside work. (Of course, some students undertake unfunded PhDs or lose their funding at some point.) So the grad student’s income is suppressed, and there is little opportunity to increase it without engaging in a side hustle. This is very different from a regular job, where there is a chance for promotion or at least opportunity to take a different job with a better salary without derailing your career trajectory. A compounding factor in this situation is the uncertainty of the length of the training period. It’s unusual for a PhD in the U.S. to take less than five years, and apparently the average is 8.2 years. This is such an issue that asking a PhD student when she’s going to graduate is viewed as a faux pas. It takes an unusually driven graduate student and motivated advisor to accurately set the end date for the graduate degree more than a year in advance, let alone at the start of grad school. And even the end of graduate school doesn’t mean the student will get a big income boost, as 65% of PhDs will continue their training as postdocs. These factors together mean that a grad student has a low salary for an uncertainly long amount of time: at minimum half a decade, and for many a decade or more. The exact nature of the relationship between the university and the graduate student is being reinterpreted at many universities around the US due to the recent National Labor Relations Board ruling that allows the unionization of graduate student assistants at private universities. Graduate students are certainly “students” in the eyes of the university, and graduate assistants are also considered “employees” secondarily. The benefits offered to graduate students therefore often straddle these two statuses; they receive some or all of the benefits that undergraduate students do, but virtually always less than other classes of employees like faculty and staff. Commonly, graduate students take part in the student health insurance plan, and the premium might be partially or completely paid as one of their benefits. Beyond that, benefits vary widely by university, school, and program. Some graduate students may have defined vacation policies while others’ are left to the discretion of advisors; some get dental and vision insurance alongside health insurance; some receive subsidies for housing or childcare; some receive a free or subsidized gym membership; very few even have access to a 403(b). Common financial advice to young professionals to take full advantage of employer benefits by contributing to a 401(k) at least to the full match amount and maximizing the value of life, disability, health, dental, and vision insurance benefits therefore does not apply to graduate students. Conversely, graduate students may access to student benefits that are very unusual outside of universities, and it’s very important in those cases that the students are aware of all their benefits. While grad students receiving stipends have an income, they don’t all have “taxable compensation” or “earned income.” Graduate students (and postdocs) whose salaries are paid by fellowships are not being compensated/earning their income. (Their income is still taxable, however.) They are not employees, but neither are they self-employed. Therefore, they are not eligible for tax benefits that are tied to having compensation or earned income, such as IRA contributions and the earned income tax credit. Having an income that is not reported on a W-2 also may throw a wrench into the process of taking out a mortgage. This situation is very hard to wrap your mind around when you first hear about it because it is so different from what (self-)employed people experience. The silver lining to having a low income is that you don’t have to pay much in the way of income taxes. Nearly all graduate students whose only income is their stipend will fall into the 15% marginal tax bracket or lower. Therefore, tax reduction strategies that might be recommended to young professionals are not as beneficial for graduate students. For example, contributing to a Roth IRA is a great idea for a graduate student with taxable compensation, while a young professional with a higher income might benefit more from using a traditional IRA or 401(k). The unexpected bonus to being in the 15% tax bracket or lower is that the current federal tax rate on long-term capital gains and qualified dividends is 0%. Therefore, even graduate students who are saving for retirement outside of tax-advantaged retirement accounts can minimize the tax bite on their investments. Finally, graduate students do not have to pay FICA tax, either because they have a student exemption or because they aren’t receiving compensation. Young professionals can’t easily avoid that 7.65% tax bite. Lastly, graduate students have the option to take out student loans. If the student experiences an income drop or a personal emergency, they could take out a student loan to cover it, whereas a non-student would more likely turn to credit cards or personal loans. While using a student loan in these circumstances might be advantageous in some ways (for example, the interest rate is almost certainly lower than the interest rate on a credit card), student loans are more uniquely dangerous than other kinds of debt because they cannot be discharged in bankruptcy. A graduate student, because of this access, therefore needs enhanced information and counseling when looking to take out a new loan. In what ways are graduate students financially different from their age-mates who have real jobs? Is outside work/income explicitly disallowed in your contract or the terms of your funding? Graduate student stipends come from one of two broad sources at any given time: an assistantship or a fellowship. Some universities require students serving as research assistants or teaching assistants to sign an employment contract. If you signed such a contact, check it through carefully for prohibitions against outside work/incomes. If outside work is explicitly disallowed and you work anyway, you are putting your assistantship at risk. When you accept fellowship funding, you likely agree to some kind of terms. Check through the terms for the funding carefully to see if outside work is disallowed either by the funding source or your university. It may be worthwhile to figure out what exactly is considered outside work for the purposes of the contract/funding terms. It is unlikely, for example, that rental income would be considered a violation, and there may be other exceptions for passive or self-employment income as well. Sometimes outside work has not been explicitly disallowed in a contract or no contract has been signed. In this case, evaluate the culture of your department to decide if developing an outside income will somehow get you in trouble, and if so how much trouble. The adage that it’s better to ask for forgiveness than permission may apply here. If any student caught with outside income is immediately dismissed from the program or put on some kind of probation, the benefits of a side income may not be worth the risk. However, if students seem to be allowed a reasonable work-life balance, the time commitment for a side income would probably go unnoticed. (For international students) Is outside work explicitly disallowed by your visa? F-1 visas issued to graduate students allow them to work up to 20 hours per week for their universities (e.g., as research assistants or teaching assistants), but not to have any other type of outside work (with the exception of work approved under the Curricular Practical Training or Optional Practical Training programs). This type of visa permits passive income, though what exactly constitutes passive income is not well defined. If you are an F-1 visa holder, developing a non-passive side income may jeopardize your visa. What are the exceptions to the above rules? While “No way!” may be the first-pass answer you receive when you ask if outside work is permitted by your program, there are often exceptions. Career-advancing side jobs such as short-term fellowships and internships are encouraged in many fields, and these positions are sometimes far more lucrative than grad student stipends over the same period. Grad students sometimes consult within their academic areas of expertise with their advisors’ blessings and sometimes alongside their advisors. One of my grad school classmates co-founded a company prior to applying for her PhD (she pursued the PhD to better serve as the company’s CSO), and her ongoing involvement running the company was well known and respected among the faculty. These are just a few examples of ways that outside work may be viewed by your department and advisor as aiding your progress through graduate school and career development rather than detracting from it. Even if your department doesn’t allow outside ‘jobs,’ it may be receptive to certain types of employment opportunities that are sufficiently educational. Can you generate a side income without appreciably taking away from your degree progress? You are already undertaking an enormous opportunity cost by pursuing a graduate degree. Despite the benefits you will likely experience by having a side income, make sure that they are not outweighed by the side income’s subtle costs. The main cost to watch out for is your progression through your program slowing. If your side work is taking time, energy, or creativity away from your primary job of being a grad student, you may want to forgo it in favor of focusing more completely on your work. In contrast, some grad students may consciously or subconsciously have a limit to the number of hours they are willing to work on their research, yet have additional time and energy available for other activities. How would your advisor react to learning of your side income, and how likely is it that he/she will find out? Your advisor’s attitude toward outside work or income probably matters more than any other person’s. If your advisor has high expectations of time spent working on your dissertation or RA and is generally a strict or unforgiving person, you likely won’t want to risk getting on his or her bad side by developing a side income. Red flags for that situation are an expectation of significant amounts of face-time in the lab or office and other advisees not having outside pursuits like hobbies, an exercise regimen, a social life, or children. On the other hand, if your advisor does value work-life balance and has been satisfied with your progress, a judicious choice of side job will probably go unnoticed or not be objected to. What are the benefits of having a side income? For all the potential risks of developing a side income, they can be enormously beneficial to a graduate student’s quality of life and career. The best type of side job, in my opinion, is one that both pays well and advances your career. The additional income generated by a side job is the most obvious benefit. Grad students are paid so little per hour in their primary work that many types of side jobs come with a better hourly rate. For some grad students, a side income is the main reason they are able to stay out of student loan debt, build an emergency fund, start saving for the future, or take a well-deserved vacation. A side job can help you learn or practice new skills, gain work experience, and network, all of which increase your post-graduate employability. Many graduate students with side jobs report that the work directly or indirectly helped them land their first post-PhD jobs in “alternative career” positions. Finally, a side job done well or a side income that steadily brings in earnings generates a sense of accomplishment. It seems that every graduate student goes through one or more periods of projects falling apart or low motivation during her degree. Having something to do outside of your research that you feel competent in or that has a tangible positive outcome can be quite beneficial for your mental health. Can you develop a passive income stream? If you have concerns about your advisor or department’s approval of a side job or want to work completely on your own schedule, a passive income stream may be the perfect solution. With passive income, you put in capital (usually time) up front, and then collect the income in perpetuity without any ongoing work. There isn’t much to object to about that! 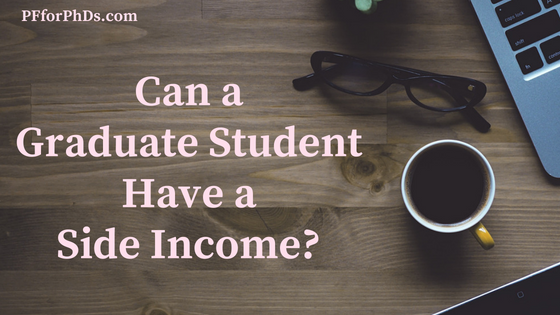 If you are/were a grad student with a side income, please share it in our Side Income Series!